If you paid any Independent Contractors more than $600 in one year, for service work, you need to submit a 1099-MISC form (1099 for short).....both to the Recipient and to the IRS. To read more, click here. On a half sheet form, you fill in a few boxes. Your name, address, phone number, and tax ID number. Your recipients name, address, tax ID number. The amount you paid them. You send a copy to the recipient, to the IRS, and you keep one for yourself. Photos with notes below. First some information. You can choose to use paper forms or to file electronically. Paper forms are carbon and MUST be ordered from the IRS or another source. They canNOT be printed. To ORDER forms, click here. To see a walkthrough of ordering forms, click here. I haven't worked with e-filing yet. Some tax software systems provide this, such as TurboTax. The IRS also gives this tip, "To locate an IRS business partner who may be able to offer low-cost or even free filing of certain forms, enter "e-file for business partners" in the search box on IRS.gov." Some accountants will also do this for you. • Amount you paid them ~ called "Nonemployee compensation"
Use this prep sheet to keep things straight! Click on it to get a PDF. :) This will also help when it's time to file your IRS taxes later this Spring. Like the Charlie's Angels, there are actually 3 forms that you'll be working with! They always go together. 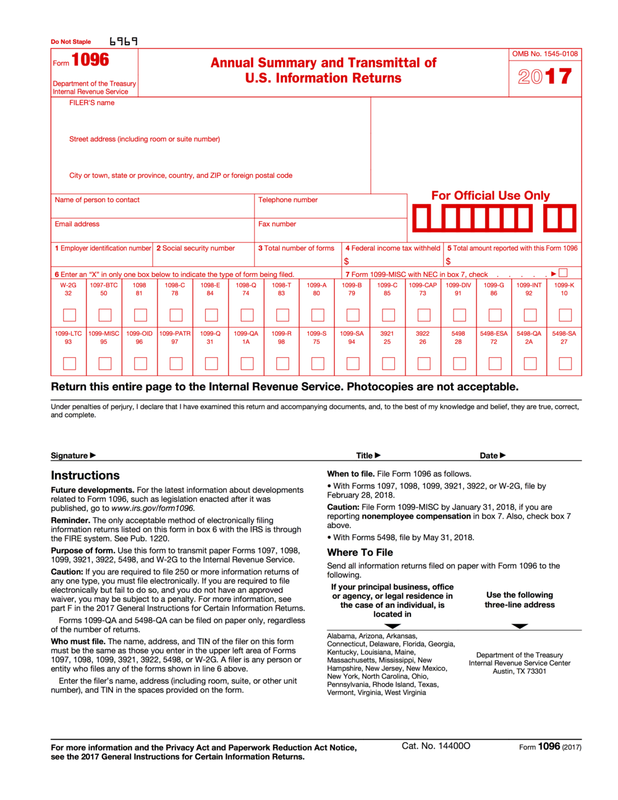 W-9 The IRS created a W-9 form to collect the required information from recipients, including their tax ID. It's a one page form with lots of pages attached. As you can imagine, tax ID numbers are sensitive information, and W-9 forms must be stored securely. You can collect W-9s on paper, or electronically. Click here to download from the IRS.gov site. 1096 This is like a cover letter. When you submit certain types of forms to the IRS, they want a 1096 as well. It's basically a summary of everything you're sending in. Important Things to Know When Filling Out Paper Forms! 1. Use a BLACK ball point pen, press hard! 3. Do NOT add any symbols. NO dollar signs, NO apostrophes, NO number signs. > > If you happen to make any mistakes, check the VOID box at the top of the form, and start again. • You must use a FLAT envelope, with no folds. • It must be postmarked on or before January 31, 2018. Two separate forms are on each page. 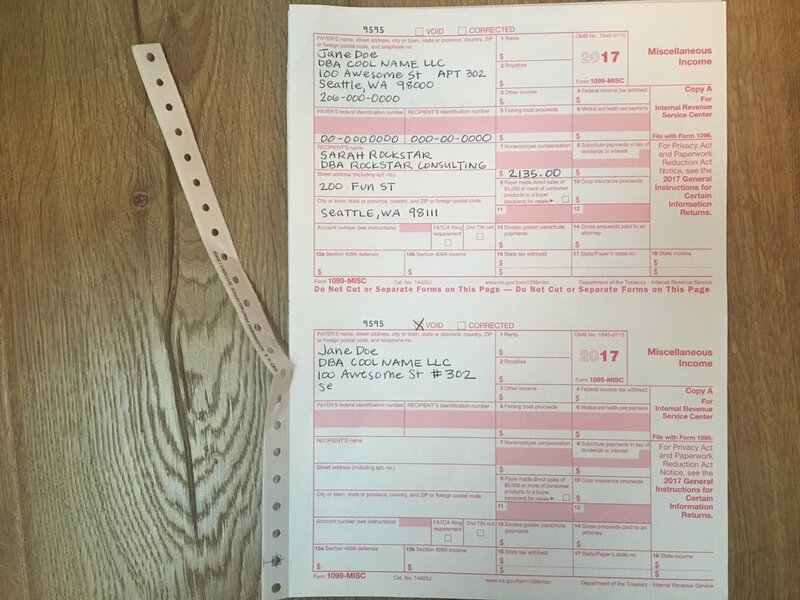 This shows the top sheet which is sent to the IRS. Do NOT cut this page. The pages underneath are torn in half before giving to the recipients. Notice the names. It's important to write both the recipients full legal name AND the business's legal name. Whenever a business is a Sole Proprietor or Single Member LLC, you may use either the SSN (social security number) OR an EIN (employer identification number). This example shows the Payer having an EIN. The recipient using their SSN. On the bottom form, I made a mistake! I used a # sign. This is not allowed, so I stopped filling it out and marked the VOID box. After they are filled out, tear the strip off and separate the forms. Here's a look at the 1096 Form. 1. 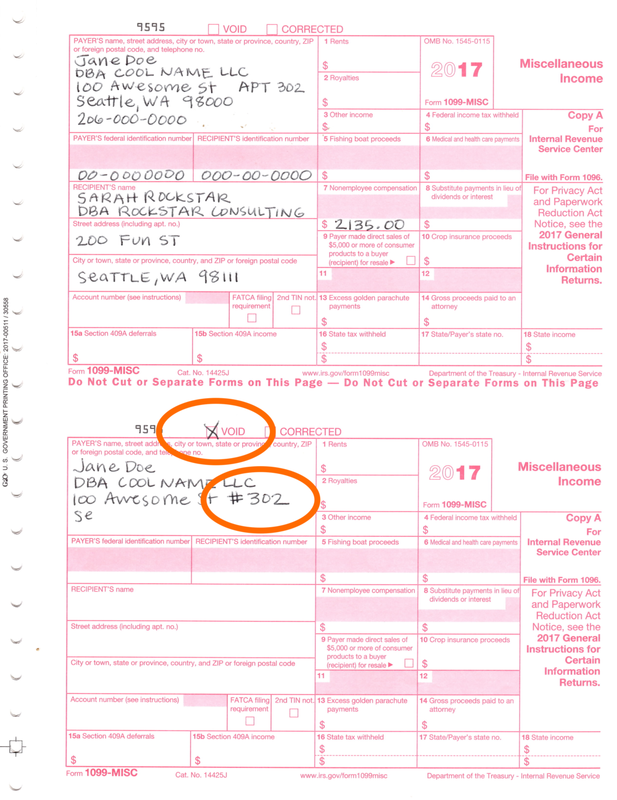 Be sure to check the box 1099-MISC. 3. Number of forms. Put the number of filled out 1099-MISCs. There are two per page. If you filled out for 3 recipients, you're write "3". 4. "Total amount reported with this Form" Add up the total of all dollar amounts on all forms. If I was reporting $2100 for a coach and $1400 for a designer, I would record $3500 in this box. Well done! Bravo! Even though the contents of this are straightforward, it can feel so taxing because it takes a lot of care and attention, yet it is boring. In addition, just the thought of the IRS can be triggering or get the adrenaline going. ♥ If you can, find a time to relax a bit. Perhaps a bath, a trip to Ladywell's, a long walk, even a short walk around the block. Also, remember to check off of your Cheat Sheet / Sticker Chart!